My name is Beatrine Heilmann. I´m a researcher in Oqaasileriffik, and working with language technology under Oqaaserpassualeriffik. I´m a full-time student in Ilimmarfik beside my work at the Institute of Language, Literature and Media. My work consists of language technology, where I´m working with individual words, but I expect to work with sentences in future. First I was hired as research assistant from 2006 to 2009, but hired as researcher from 1st November 2009, after I graduated. My name is Erik Bjørn Fleischer. I was born in Qaqortoq in South Greenland February 13th 1949. I stayed only two years in Qaqortoq so Qaqortoq does not play any major role in my childhood whereas Paamiut does since I moved there to live with my grandparents when my mother left to get her education in Denmark. I lived 7 years in Paamiut until we moved to Nuuk where I lived for many years. I was born Nielsen and had that name until i married in 1972 and adopted my wife’s family name, Fleischer. My ancestors are the Berthelsen family that according to my grandfather’s tales spring from the Maniitsoq area but whose members now are widely scattered everywhere in Greenland because of the frequent relocations chatecists had to cope with in those days. For a number of years I worked as a sailor in Greenland and Denmark. Later on I got an education as skipper on home-trade vessels and first officer on bigger ships. 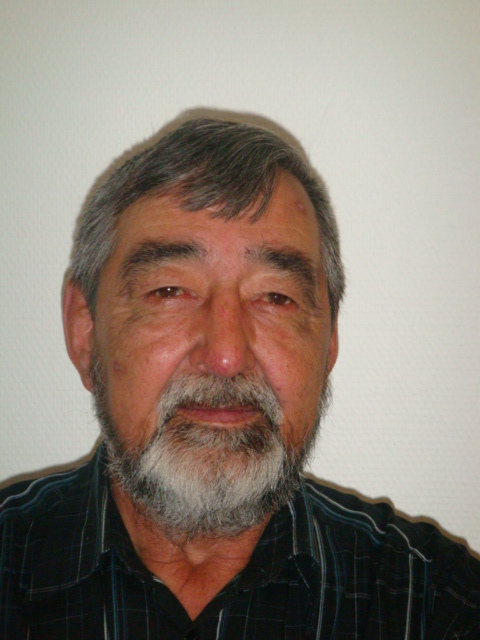 In 1974 I started to teach at the seamen’s colleges in Nuuk and Ilulissat and finally in 1996 I was appointed vice headmaster at Imarsiornermik Ilinniarfik (the seamen’s college) in Paamiut where I have worked since. My interest in the Greenlandic language began already in my childhood as I as mentioned above was brought up by my grandparents also in terms of language. The language of the elders was already in those days clearly distinguishable as clearer and more exact as compared to younger language, a tendency that obviously still is prominent. When I turned twelve in 1961 my grandfather gave me a dictionary that was published in 1960. I cannot at present recall the exact wording of the kind of grammar he gave me back then but I certainly do remember the baselines: “It is of course important to know the Greenlandic language and about the Greenlandic language and to use it correctly but it is even more important also to learn other people’s languages”. In those days he of course primarily thought of Danish but in my opinion English would be the prime target nowadays since our society already is a genuine bilingual one. Those books (the dictionaries) I would sometimes aloud read out in my childhood. As I remember it the reading was from time to time less than perfect – can I see now in the back mirror. During the years of compulsory school in Nuuk and later on in my studies we were taught mother tongue by several brillant teachers. Though I could enumerate them there is one I need to mention. During my years of study we were taught by Ole Brandt. He passed on to us lots and lots of old, fascinating words but since I in those days were a rather shy boy I seldom asked the many questions I would have wanted to ask but still they lingered in my mind. After school I sometimes met Ole on a walk in town with his wife and would take take the opportunity to talk with him at length about the questions and problems I needed elaborated with his wife patiently waiting nearby. In 1994 while I was head of section at the seamen’s college in Ilulissat I started to compile Greenlandic words with Danish translations with a computer. From the beginning it was only for personal use and as a hobby. The reason why I started to compile words was that I by then realised the importance of technology in the dictionary making process. It also played a role that I all the time heard people on the radio and on television use Greenlandic according to their own ideas with little attempt of using the language correctly according to norms. Finally, I started the compilation process because I knew that we in the translation processes are in a great need of more and bigger dictionaries. Fortunately, my work was taken into consideration by Oqaasileriffik in the beginning of this millennium and included in Oqaasileriffik’s development work. Since then the computational achievements in Greenlandic linguistics have been considerable and we have no doubt much to look forward to in the future.